When thinking about modern architecture, cities like Detroit and Columbus, Indiana, may not come to mind as top places to be studied. 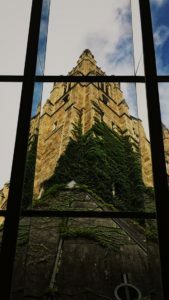 But students in a unique introductory course at the University of Michigan say they have learned much about the principles, history and politics reflected in these and other area communities through their built environments. 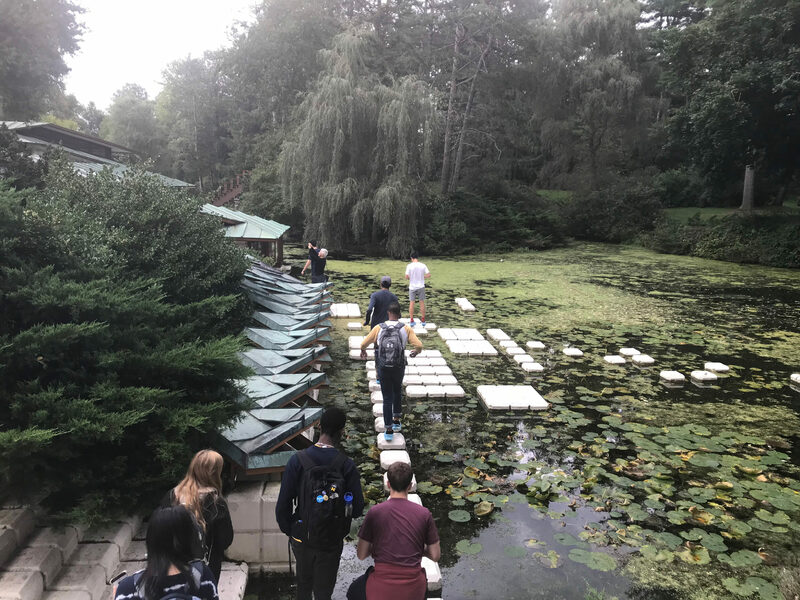 “I am learning more by being able to encounter and experience the buildings, which cannot be done in a generic classroom setting,” said Lauren Conroy, a freshman architecture student who came from a high school that didn’t offer any architecture courses. Conroy was attracted to the class because it allowed her to see the buildings rather than study them in a book. This is the first semester for On Site: Architecture in a Mobile Classroom, taught by Professors Anca Trandafirescu and Claire Zimmerman. In addition to Detroit and Columbus, students have toured the Cranbrook area in Oakland County, the Alden B. Dow House and Studio in Midland, Michigan, and the U-M campus to learn about more than architectural techniques. “We wanted to create a class that lets students interact with the buildings while also figuring out why they were built the way they were,” Zimmerman said. Each class period revolves around a specific topic or type of building, such as sustainability, structure, libraries, churches and more. 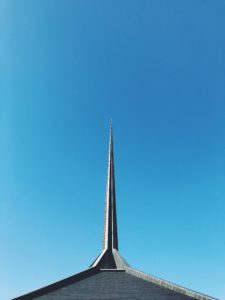 While the choice of Columbus, Indiana, may seem surprising, given the city’s size—a total of about 28 square miles and a population of roughly 47,000 people—the community south of Indianapolis is known as a showcase of modern architecture with its densely packed works from award-winning architects. “Everyday buildings, like a bank, library, church and elementary school are designed by famous architects in Columbus including I.M. Pei and Eero Saarinen, who was the architect that designed the St. Louis Arch,” Conroy said. 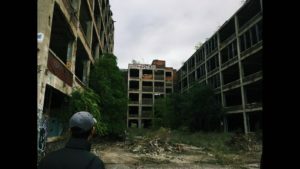 Students in the class have made several trips to Detroit, exploring the abandoned buildings and industrial parts that reflect its nickname “Motor City,” as well as the skyscrapers, newer office buildings, and churches. “I’ve never been to Detroit before so I had no clue what Detroit really is,” Conroy said. While much of the tour reflected some of the rundown images often associated with Detroit, going on a second trip to the business areas showed her a newer, revitalized city. The class also delved into the suburbs, checking out Cranbrook’s schools, temples, and churches to understand the influence of Detroit’s architecture on surrounding areas. A tour of the Ann Arbor buildings students pass by every day focused on sustainability. “Why did the designers decide to make such a large atrium through the middle of the building when the space could’ve been used for something else?” one student asked while touring the newly opened Biological Sciences Building. Guides explained how buildings can evoke feelings or encourage certain types of interactions. One of the key considerations in designing the Biological Sciences Building was creating a space for social interactions so that researchers don’t feel isolated. 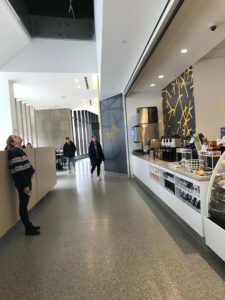 “We intentionally designed it so people have to go across the building to get coffee, go to the restrooms, etc., in hopes that they’ll run into other friends they don’t normally see,” said Scott Wood, project manager for the Biological Sciences Building. For Jeffries Hall, it was important to design a building that remained true to the U-M Law School’s beloved iconic architecture while reflecting the contemporary focus of the school’s research and curriculum. Wang finds the course to be a welcome change from her other architecture classes, which are more focused on drawing buildings. The course is made possible by a Third Century Initiative grant.